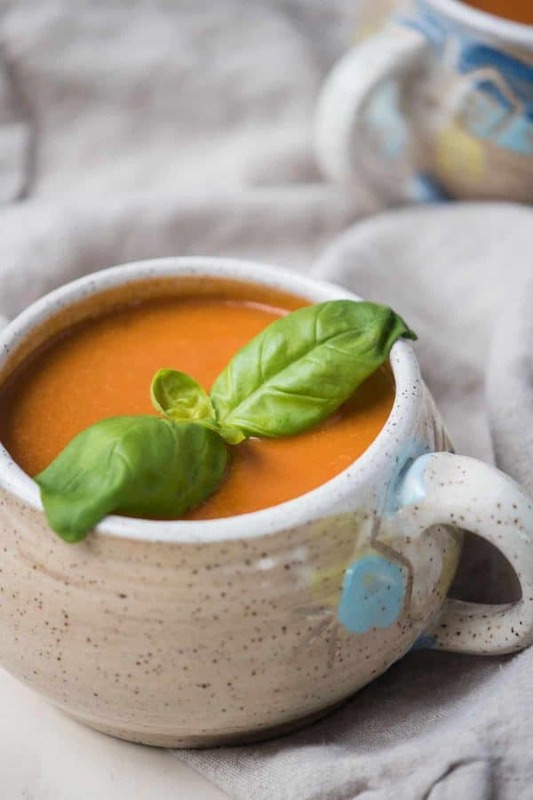 Blended raw cashews provide creamy, silky texture while crushed tomatoes and fresh basil bring bright flavors to this Instant Pot version of Creamy Vegan Tomato Soup. Oh hello Monday, we meet again. I see her, with those judgy eyes peering through cat-eye glasses. Per usual, she’s expecting me not to be prepared. Another week of scrambling for lunches and quick meals. She looking at you too? Well, for the first time in what feels like forever we tell her, “Monday, go mind your own damn business, we’re prepared. We’ve got fridges full of Creamy Vegan Tomato Soup to eat.” She walks away like she’s offended, but secretly she’s smirking with pride. The very best part of it all – pleasing imaginary Monday figures aside – this is soup is a simple three step process to good eating. Less steps means more time for the 5,000 other things you have to do today. Well thank goodness for that. Truth. Does the term ‘vegan’ have you worried about lack luster flavors? Let me ask you this. Do you have a window or a door near you? Go ahead and open it, then throw that skepticism right out. Slam it shut. 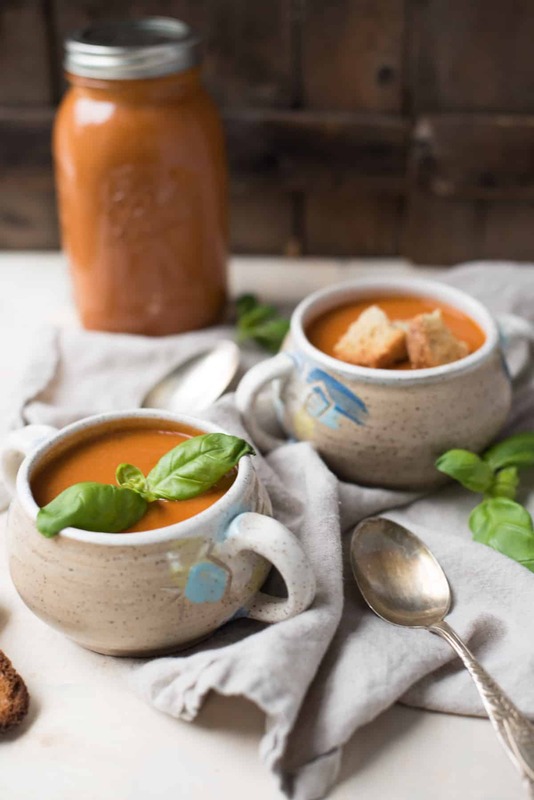 Let’s make tasty creamy vegan tomato soup, that’s just happens to be plant based. While the full truth is that this girl occasionally acts like pancetta should be a it’s own food group, I also really love incorporating a vegan day into my routine. Whether it’s pasta, or a hearty quinoa bowl with lots of roasted veggies or soul warming Creamy Vegan Tomato Soup with crunchy vegan croutons, I think it’s good to reset every now and then. 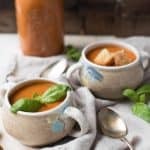 If you tried this recipe and loved it, or if you’re looking for more delicious vegan soups to try this Creamy Vegan Butternut Squash Soup. Same idea, different veggies. That being said, there are certain skeptics ::cough:: husband ::cough:: in this household that need convincing….or maybe some innocent tricking. Creamy Vegan Tomato Soup FTW folks. The option of throwing these ingredients in the Instant Pot with a borderline ‘set it, forget it’ mentality is my favorite path to travel, you can also make this on the stove top with identical results. It just requires a little more attention and stirring. To blend up smooth, a hand blender is my favorite gadget. This Cuisinart Handblender is my favorite, but you can use a standard countertop blender if that’s your only option. Just be sure to blend in two batches so you don’t overfill the blender and end up with soup everywhere and 2nd degree burns. Please folks, Mondays are hard enough, we don’t need any extra paperwork. That’s really all there is to Instant Pot Creamy Vegan Tomato Soup. Just a few steps away from that pot full of tomato soup goodness and keeping the anxiety of having quick, easy meals at bay. Well, what are you waiting for? Go tell your Monday Lady, however she manifests herself, to mind and Ps and Qs. You’re ready to battle this week with silky, plant based creamy soup bursting with bright tomato basil flavor. This post contains affiliate links. Should you purchase the product, the price you pay at check out doesn’t change but I make a small commission from the sale. Thank you for your support! 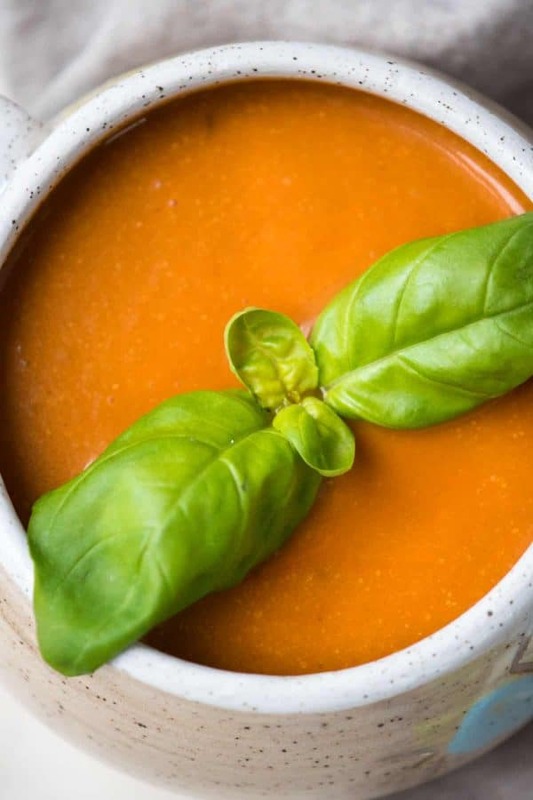 Silky, rich texture and bright tomato basil flavor pop in this easy, no fuss Instant Pot Creamy Tomato Soup. In the instant pot, add olive oil and onions on ‘Sauté’ setting. Sauté until translucent, 4 to 5 minutes. Add remaining ingredients to the pot. Seal the pot with the lid and set the steam valve to ‘sealing’ position. Press the ‘Soup’ or ‘Manual’ button and cook high pressure for 20 minutes. Let the pot naturally depressurize for 10 minutes before moving the steam valve to vent. Once the red toggle button is down, remove the lid. Using a hand blender or carefully transferring the soup to a standing blender. Blend on high for 5 minutes until smooth and creamy. Optional: Brush pieces of your favorite hearty vegan bread with vegan butter and cut into squares. Sprinkle with vegan parmesan cheese and toast in the oven on 375°F for 5 minutes or until slightly brown and crunchy. Stove Top Directions: After incorporating all ingredients to the pot, bring to a boil over medium-high heat. Reduce the heat to low and simmer for 35 minutes, stirring frequently to ensure the tomatoes don’t stick to the bottom of the pot. Note about blending: If you don’t have a hand blender, a regular standing blender can be substituted. You may have to transfer the soup in two batches, leaving about 4 inches of space from the top of the blender. Don’t forget to be super careful, as the soup and the pot will be very very hot! This looks so creamy and delicious! You would never know it was vegan! 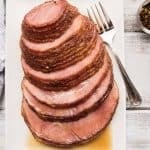 Tomorrow is the day when I’m finally getting an Instant Pot! It’s ridiculously cold here, so I can’t wait to make warming soups like this one. I love how creamy cashews can make recipes. I’d never guess there wasn’t dairy in this! Will be making soon. I love cashew creaminess 🙂 I use it ever so often in my curries when I need to cook a vegan meal. The soup looks delicious and thank you for stove top instructions too as I don’t have an instant pot. Marking this one for the next soup night. I’ve got to get an Insta-pot. I thought I’d hinted enough at Christmas but to no avail. Your soup looks and sounds delicious — I bet Hubby was a believer once you served it to him. Can’t beat quick and easy. I never even told him it was vegan! There are some things I just have to keep to myself ???? I’ve never tried adding cashews to soup before, but it sounds amazing – what a great way to get that creamy, rich texture! 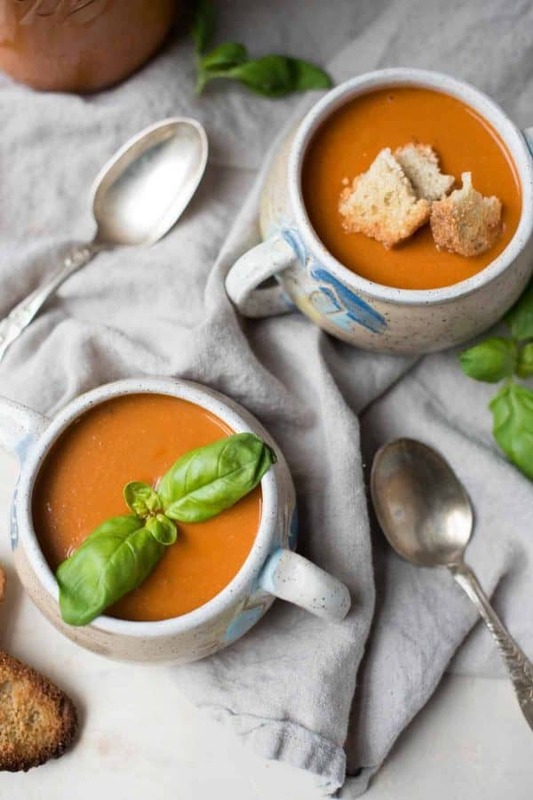 I love a tasty, cozy tomato soup! This sounds amazing! Few things are more comforting than a good homemade tomato soup. Love that the creaminess comes from cashews rather than heavy cream. Going to give this a try! Just what the doctor ordered for this dragging winter! Love the addition of cashews! I’m always on the hunt for new Instant Pot soups. I love that this one is vegan and so healthy! Guilt-free recipes are the best. Your tomato soup looks so creamy and satisfying. I’ve never used cashews as a replacement for cream before, but never in tomato so. I’m going to have to give this a try! 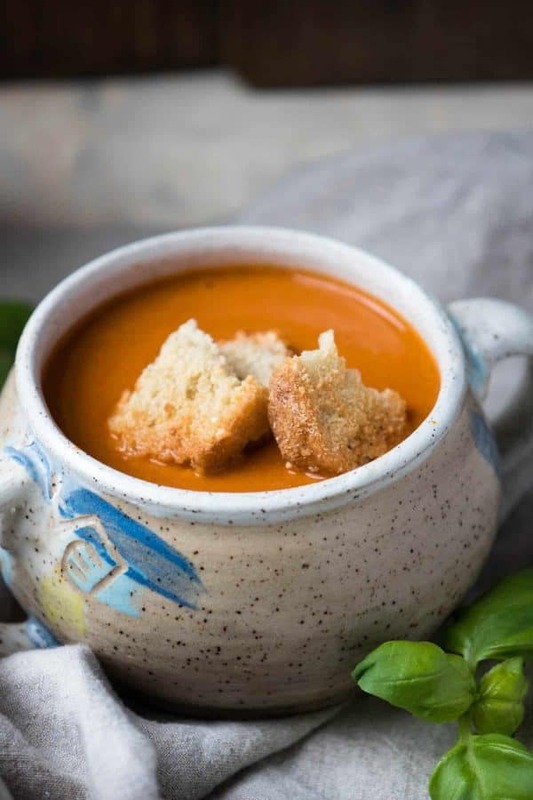 I’ve been digging on the blended cashews recently since I just went dairy-free, and I’ve been missing cramy tomato soup (especially this time of year!). This is just the ticket!! !